Keystone Heritage Park is an archeological site, an archaic wetlands and a botanical garden. The 52-acre park in El Paso’s Upper Valley is a City-owned property leased to a volunteer Board of Directors who are charged with preserving and developing the Park. Keystone Wetlands is home to many species of birds and is a stop on a migratory route for even more. Over 193 species of birds have been spotted there, including 22 species considered rare by the Audubon Society. These archaic wetlands, protected by Federal Law, depict the wetlands that once lined the Rio Grande. The Botanical Garden at Keystone is a project adopted by the Junior League of El Paso in the year 2000. In 2003, the Rotary Club of El Paso committed to building Phase Two of the garden. The Garden encompasses features such as a Xeric demonstration garden, a children’s garden, an amphitheater, a moonlight garden, an ethno-botanical garden and more. This Garden represents an approximate $1.2 million investment in our community and is the result of donations and volunteer work by individuals and businesses on both sides of our border. The now maturing garden is available for events such as weddings, reunions and corporate gatherings. Please call 915-584-0563 for information. The History of Keystone Heritage Park began in 1997 with the formation of the Keystone Archeological Preservation and Protection Association. By 1999, there were more than 300 members and the project was broadened to include the archeological site. In 1999, the Keystone organization was born. At first a project of the El Paso Community Foundation, Keystone obtained its own designation as a not-for-profit organization in 2000. 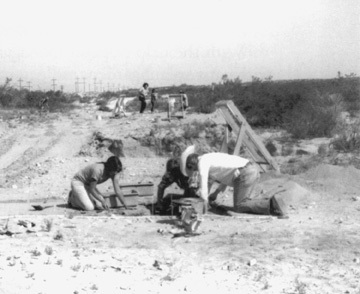 In 2000, Keystone Heritage Park volunteers convinced the City of El Paso to sponsor them in applying for a Texas Highway Department highway beautification grant (TEA-21). KHP prepared the grant proposal and with some lobbying managed to win a grant for approximately $1.4 million to purchase and preserve land bordering the wetlands that were eventually donated to KHP. By late 2002, the land was acquired, all transfers made and the city of El Paso entered into a 30 year lease with KHP for the management and development of the park. Keystone Heritage Park is currently an IRS approved 501(c)(3) organization with a 15-member board of directors composed of community leaders and volunteers. The Keystone board is diligently working to assure the long-term success of this valuable asset. The extensive involvement of other community organizations, such as Rotary, Jr. League, the Audobon Society, numerous boy scout troops and more, demonstrate the community’s commitment to the success of the project. Future Plans for KHP include completing a ten acre section called the Chihuahuan Desert Experience. Currently there are walking paths providing a view of the birds in the wetland. Future development of the area includes planting with native Chihuahuan Desert plants. The Board is also involved with development of the archaeological site. The recently completed professionally written synthesis provides a way forward in making the most of our archaeological treasure. The next step is ground penetrating radar — to exactly locate the hidden houses and artifacts. Those working to develop Keystone Heritage Park envision that the Park will soon become a tourist attraction as well as a source of pride to those who live in the region.